Laura Tisserand is from Hammond, Louisiana. She trained with Phoebe Brantley in Baton Rouge, Joseph Giacobbe, and Richard Rholdon in New Orleans, and on scholarship at the School of American Ballet and Pacific Northwest Ballet School. She joined Pacific Northwest Ballet as an apprentice in 2003 and was promoted to corps de ballet in 2004, soloist in 2010, and principal in 2014. 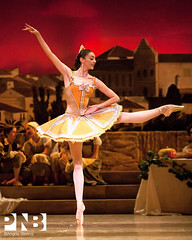 Ms. Tisserand has performed as a guest artist with Lafayette Ballet Theatre.